While in school I didn't much care to go plein air painting. I struggled with it and couldn't find anything to keep me interested in it. Its not that I didn't enjoy landscape painting, I just didn't like to go outside and paint it. That has changed. Now that I have been out of school for sometime and teach landscape painting, I have had the chance to explore what plein air painting is all about and I find that I enjoy painting plein air quite a lot. 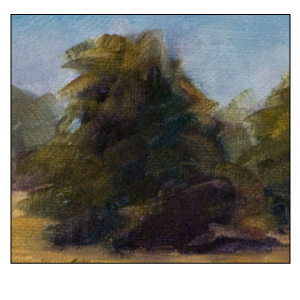 It just took me some time to figure out how to apply what interests me in painting to the plein air process. 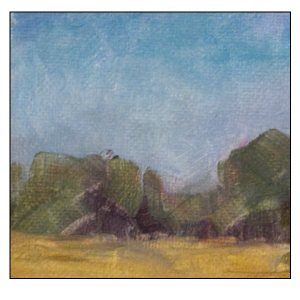 I like playing with color and I now paint small plein air landscapes as an excuse to play with color and try new approaches. If you were to compare my paintings to the scenes I used as reference you would see that I do not try to mimic or copy exactly what I see. I usually simplify the scene to make a nice clean composition and then use the environment as a reference to set up the light and color cues. My goal in this painting was just to play with color contrast and harmony. I wanted to keep the colors related enough to create the sense that everything belonged together and the colors harmonized. At the same time, I wanted some color contrast to occur to draw attention to particular areas of the painting. To do this, I kept the overall color scheme in or near the yellow to green spectrum and accented a couple of areas with a blue violent color. You may notice the sky has a little bit of yellow in it. This is to allow the color of the sky to relate to the colors on the ground. While the sky is blue, there is enough yellow to connect the sky to the rest of the environment. I created the largest difference in color contrast within the trees of the middle ground. This is were I wanted the focus of the painting to be. The light side of the trees are a warm yellow green, the shadows are a cool blue violent. 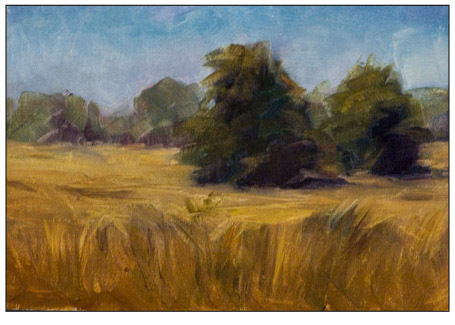 If you like to paint landscapes I suggest that you give plein air painting a try if you can. Though it may be challenging you may find it to be plenty of fun and rewarding. For me its a great way to just enjoy painting.